This is one very interesting topic as I have always wondered how a Craps table is made, and since I’ve loved the game for over 20 years, always wanted one of my own. I honestly believe that a finished Craps table can be classified as a piece of art. I’ve looked and looked for a place that sells them but alas can’t seem to find anywhere. If you know of somewhere please leave me a comment. In the absence of buying one, I’ll have to make one, or convince someone else with more woodworking skills and equipment to build one for me as a worthy project. I’m thinking maybe one of the local Mens Sheds would be able to help me out for a nice donation to their very worthy cause. I think it all starts with the felt layout, so I’m going to source that first and then build the table up around it. I’ll be documenting the journey, which is the purpose of this website for my own selfish diarised record and others will benefit as well. In the mean time I’ve scoured the internet looking for “how to build a craps table” resources and found that quite a few people have the same idea. 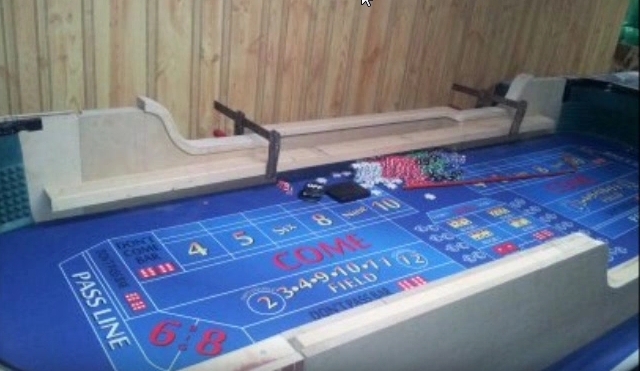 Out of all the designs you can pick and chose how you want to build your craps table. Take ideas from each of them and model to your requirements. I’ll make you a great 6 or 8 foot table. With modern speed cloth and a nice bounce. Check out my web site. Choice of four colors. Double chip rail and arm rest to match. My 6 foot tables come with a center mounted 21,PaiGao, Poker, felt layout for a nominal charge. Give me a ring even if you just want to talk craps. My number is on my web page. Great work Big Jeff, your tables are wonderful. I want one, I wonder what the shipping would cost to get one shipped to Australia and through customs. I want to purchase a 8 foot crap table for my play room. Fact is the tables that were selling at 995.00 are no longer available cause these have been sold. What is the price of your 8 foot crap table ? Hello, What is the cost of the 8ft table? Not sure which table you are referring to? How did you get the diamond to stay? It’s so heavy !